Grandma Bear is someone who I cannot say no to. I no longer remember the original reason for tonight's dinner, but it had something to do with an offering expiring by the end of the month. Dining at the Mandarin Oriental with Tigger is dangerous, and nowhere more so than Mandarin Grill + Bar. I should have known that Uwe would not neglect his VVIP. Salmon and caviar cornet - yummy. A little bit of Thomas Keller. This was a lovely, lighter version of the Italian classic - with asparagus, celery, carrots, tomato, peas and oregano. Amadai: chicken wing, girolle - next round of utensils saw all of us with the same knife… which again meant that this was something extra before our individual mains. Uwe's amadai (甘鯛) is pretty amazing with those crispy scales that are incredibly yummy. Now you've got a boned chicken wing sitting at the bottom, lightly flavored with cumin, truffle sauce and mash. A single girolle sits on top of it all. Lobster: Brittany, blue, leek, green asparagus, parsley, consommé - we finally get to the other dish I ordered, and I wasn't the least bit hungry by this point. I took this because I wanted to compare it with what I had at André last week. Well this wasn't exactly a tasting portion, so I guess it was not gonna be as delicate… The homard bleu itself was a little on the raw side and texture-wise not as perfect as what I had in Singapore. The parsley mousse was interesting, as was the fennel. But the highlight of the dish for me was something totally unexpected. There was a scattering of black "dirt" around the roots of a single leek, as if the leek had just been uprooted and placed on the plate. The dirt was actually charred leek ground into powder, very much like what I found at Les Créations de Narisawa. Once again Uwe was displaying a little of his playfulness, and I'm a total sucker for that! I was certainly not in any shape to have dessert, but nonetheless the kitchen sent out a little something. Besides an edible candle made of chocolate and marmalade meant to belatedly celebrate a birthday, we received another playful creation: more chocolate. 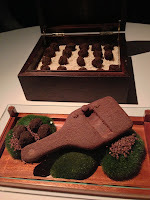 We got a bunch of chocolate truffles - made with black truffles - along with a truffle shaver made of chocolate! Oh yes, we love to play with our food! 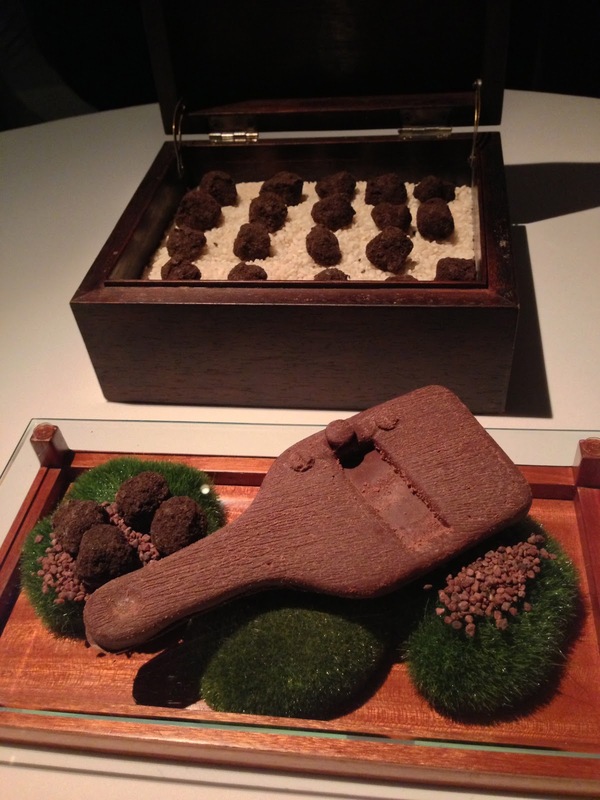 There were actually two kinds of chocolate truffles: the ones to the left of the shaver were made with black truffle ganache; the ones on the right were made with bits of black truffle, which meant the flavors were much stronger. Very yummy. I was really full. I was posting messages on Facebook and Twitter about Tigger and Uwe stuffing me till I was on the brink of explosion. If, after reading this post, you find that this blog was no longer being updated, you know what happened and who was responsible… But as a friend remarked, this wouldn't be a bad way to go!